The control of suction pressure by varying the speed of refrigeration compressors provides many advantages. If the installation is designed correctly then important considerations such as improved quality of stored goods, energy saving, improved performance at light refrigeration loads and increased working life can be easily achieved. With speed control refrigeration compressors are operated outside the normal area of operation defined and specified by the manufacturer. It is therefore very important to take certain electrical and refrigeration technology restraints into consideration. 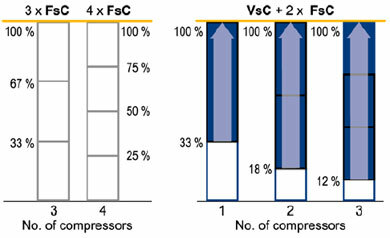 This article will investigate compressor packs with a "master" variable-speed compressor connected in parallel with several fixed speed compressors. This concept is based on the use of intelligent variable frequency drives. These variable frequency drive types can handle the open-loop and closed-loop control tasks in the compressor pack. 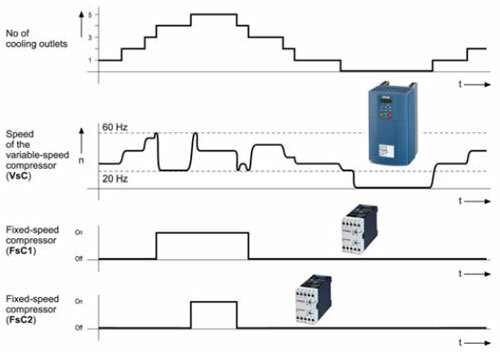 The main function of the intelligent variable frequency drive is to maintain the suction pressure constant by continually adapting the speed of the variable speed compressor. As soon as the refrigeration power of the variable speed compressor is no longer sufficient, a fixed speed compressor is switched-in, see Fig. 1. The system automatically adjusts itself to the refrigeration power required. A typical system utilizing this technology is shown in Fig. 2. It is in principle possible to use two or more variable speed compressors in a refrigeration circuit. However, in practice, such systems do not provide any significant benefits so that these systems will not be considered in this article. - variable speed compressor (using a master compressor regulated using a variable frequency drive) + 2 x fixed speed compressors. Fluctuation of the suction pressure, caused by switching on or off a fixed speed compressor are minimized. Using variable speed compressors with the highest possible maximum speed/frequency. The associated problems will be discussed in more detail in the following sections. Several years ago it was extremely difficult to obtain technical application data at various speed/frequency points from compressor manufacturers. This is understandable as the complex measurements required to type-test a compressor are generally carried-out at 50 or 60 Hz. Data which was available for operation at other speeds were conservative general data which were applicable for all compressors in a particular range of types. Is the lubrication system able to fulfill the required lubrication requirements? Is the oil transport in the refrigeration circuit sufficient for a reduced volume flow? Is the cooling of the motor winding of a semi-hermetic variable speed compressor adequate? 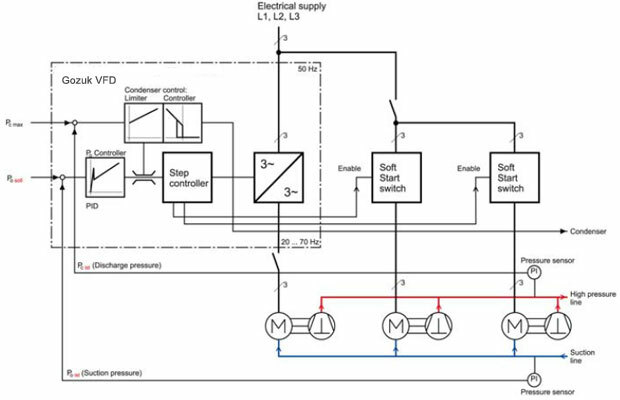 In order to evaluate the winding cooling of a semi-hermetic variable speed compressor at reduced speed, detailed measurements were carried-out with typical compressors. 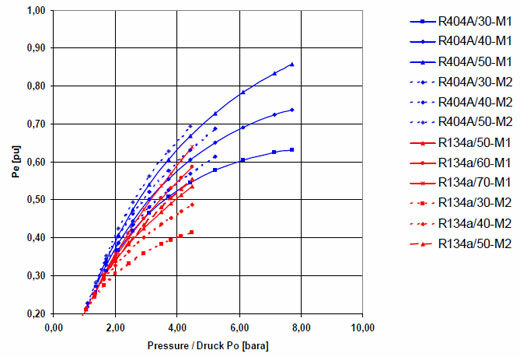 The evaluation of the measurement results of a mid-range compressor is shown in Fig. 4. The increase in the winding temperature (twind) due to the reduced volume flow at low speed/frequency can be clearly seen. Measures to ensure adequate winding cooling are described in the following section. In the meantime, important manufacturers specify the minimum speed for variable speed compressor operation of their reciprocating compressors in the range 20 ... 25 Hz. Very often lower speed limits can be implemented on request when the refrigeration-related operating points are known. These lower minimum speeds turn out to be extremely advantageous. The minimum power of a compressor bank is of particular importance, especially for supermarkets. In winter operation with the display cases and freezers covered, the refrigeration power which is required is relatively low. If the refrigeration system is over dimensioned compared with the required refrigeration power, then, even when the variable speed compressor is operated at the minimum speed/frequency, the low refrigeration power required can only be achieved by frequent on/off switching of the master compressor. This situation can be resolved by using a variable speed compressor combined with capacity control (cylinder-bank off loading). However this requires a close coordination with the compressor manufacturer and is not possible with all compressors. Also a very careful design of the refrigeration circuit in connection with oil transport is required. It makes considerable sense to use a variable frequency drive to increase the maximum speed. Almost all of the compressors are mechanically designed for operation on 60 Hz electrical supplies. The refrigeration power of a compressor can be easily increased by approx. 20%. With some compressors and with some manufacturers it is often possible to increase the speed even further. The manufacturer must be contacted on a case-for-case basis, specifying the installation data. Operation up to 65 Hz (approx. 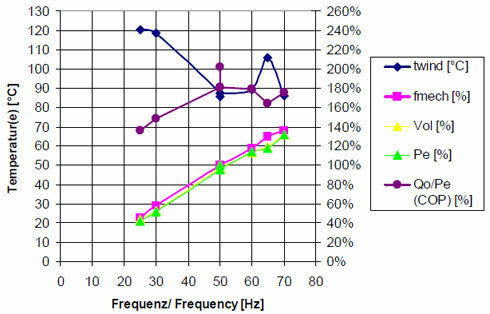 30 % increase) or even up to 70 Hz (approx. 40 % increase) is often possible. The application limits generally lie in the area of thermal and flow-related stressing in the discharge area of the compressor. It is especially important to avoid over dimensioning the compressor bank, especially for operation in the partial load area (refer to the previous section). 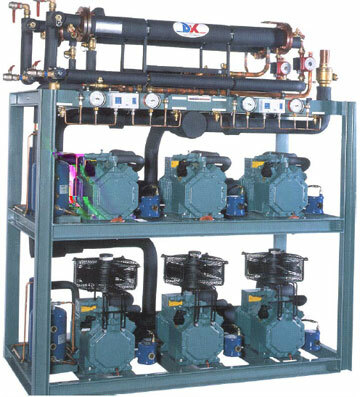 Open and membrane type compressors. The reciprocating compressor, which is well-established worldwide, will now be discussed in more detail. The refrigeration-related performance data of a typical semi-hermetic compressor, with different motor sizes, is schematically shown in Fig. 5. At the critical operating points, the electric power Pe drawn by the smaller motor (M2) is significantly greater than that of the larger motor (M1), see Fig. 6. The larger motor (M1) has a larger internal surface for cooling with refrigerant (suction gas cooling). At the specified operating point (see Fig. 6), the larger motor (M1) has a lower loading which means that the winding temperature increase is significantly lower. The starting phase of a variable speed compressor is of decisive significance for disturbance-free operation of the refrigeration system. This especially applies to small compressors with two cylinders which require a high starting torque. According to published information, torque reserves of 60 % are required for starting. In the field, the compressors must be able to start at high evaporation pressures. This means that it is not sufficient to just consider a particular operating point. Example: If the power is interrupted for several minutes, the evaporation pressure rapidly increases, the condensation pressure is still high – and the required starting torque is now quite significant. If the compressor was not able to start, then the motor winding does not have an opportunity to cool down, the winding temperature and therefore the winding resistance significantly increase at each start attempt. This generally ends in the motor being tripped by its thermal thermistor monitoring. The motor winding is significantly stressed. The authors of this article recommend that this technology is ONLY applied for compressors with larger motors. The additional costs for the compressor compared with the aggravation associated with starting problems is negligible. It is necessary to use what first appears to be an over-dimensioned variable frequency drive in order to ensure reliable operation. This means that the variable frequency drive is mainly dimensioned to achieve the correct starting torque. There is nothing worse than a compressor that cannot start. This means that it does not make sense to dimension a variable frequency drive according to the rated operating point as is generally the case for fan and pump drives. This new technology can only be widely used if the necessary rated power of the variable frequency drive has been clearly defined. The authors have drawn-up so-called compressor "Cross Reference Lists" for this purpose. The required variable frequency drives for all common compressors summarized in the form of a data base taking into account experience gained in the field with "problematical compressors". The integrated closed-loop suction pressure control ensures that the speed of the variable speed compressor is set corresponding to the actual refrigeration requirement. A fixed speed compressor is only switched in if the refrigeration power of the variable speed compressor is no longer sufficient. The integrated refrigeration software of the system can control up to three fixed speed compressors. An external compressor pack step-controller is not required and is also not permissible (otherwise there would be competing with the integrated suction pressure controller). The minimum running and switch-off times, specified by the various compressor manufacturers, are taken into account in the software. A block diagram of the closed-loop control and common system control are shown in Fig. 7. When a limit pressure is exceeded, the speed of the variable speed compressor is automatically reduced. In summary, there are several precautions which must be given careful consideration. There is a need to train refrigeration technicians and installers in electrical engineering "know how", especially as far as EMC is concerned. The use of web-server based systems to monitor the compressor bank and, if required, the condenser. The fieldbus system is especially interesting for future refrigeration systems as all leading manufacturers of refrigeration-related components and control systems operate together to define a global standard. This work is well-progressed. The new technology of closed-loop speed control compressors has already been taken into account in this standard. The first attempts to use this technology go back over 10 years. Back then, the variable frequency drives which were available were very expensive, prone to faults and only had, to some extent, the necessary control functionality. For approximately 5 years now, several experienced companies have increasingly used this technology with considerable success. In the meantime, there are over one thousand refrigeration and climate control systems operational in China and worldwide equipped with Gozuk variable frequency drives and which operate to the complete satisfaction of their users. There is now a very close cooperation between leading compressor manufacturers and the proponents of this technology. This means that there are common efforts to carry-out the necessary training measures to widely establish this technology. This use of this new technology requires a lot more system philosophy than with previous conventional technologies. The advantages of this new technology can only be achieved by correctly designing and installing the refrigeration, control and electrical systems. This is the reason that system partners and distributors, with the right level of technical experience and know how, play an important role.